14ymedio, Yoani Sanchez, Generation Y, Havana, 5 July 2018 — At the entrance to Humboldt University in Berlin, an inscription in Spanish says that the statue of the German scientist Alexander von Humboldt that stands there was a gift from the University of Havana, in homage to the man who has been called “the second discoverer” of Cuba. Cuban biologist Ariel Ruiz Urquiola repeatedly passed that statue with its serene face during his time at that institution of higher learning. In recent days the name of this young researcher, 43, has graced the covers of numerous international media, for having maintained a hunger strike for more than two weeks. With that strict fast, Ruiz Urquiola demanded his release after being sentenced to one year in prison for the alleged offense of “contempt,” in a flawed case plagued by irregularities. Thus, the scientist put his life at risk to demand freedom, using his own body as a lever of complaint against what he considered an injustice. On Tuesday, the Cuban authorities yielded in their stubbornness and released Ruiz Urquiola. For health reasons he was granted a parole which does not totally annul his sentence, but it does permit him to return to his home and to the agro-ecological project he manages in Viñales. Although his tenacity allowed him to win this battle, he knows that the eyes of the ruling party will be watching for any false step in hopes of making him shoulder “the blame” for his public demands, putting the Government on the spot and, above all, denouncing the ecological damage that it commits in that protected area of ​​the Cuban West. If Alexander von Humboldt lived during a time of discoveries and explorations, Ruiz Urquiola is living during a hard time of complicity on this Island. 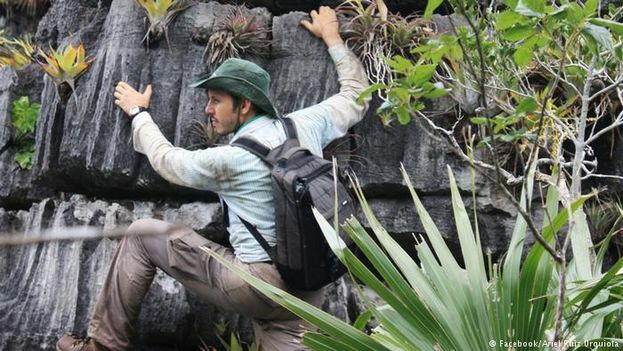 The German explorer helped to expand knowledge of the geography, flora, fauna and even the topography of a country that he himself barely knew, but more than two centuries later the Cuban scientific community is trapped between a lack of resources and excessive state control. Researchers are now evaluated based not only on their abilities and the results of their projects, but most importantly on their ideological fidelity. It comes as no surprise, therefore, that during all the days the biologist refused to eat, there were no pronouncements of solidarity, nor even a call to review his case, on the part of functionaries, educators and staff of Cuba’s Ministry of Science, Technology and Environment. Nor did any official entity linked to agricultural production, the care of the ecosystem or the study of fauna raise a single voice to demand justice for Ruiz Urquiola. The official media never mentioned the case, although social networks lit up with messages that demanded his prompt release and his face was a constant presence on the alternative information networks that cross the country. Meanwhile, in contrast to the silence of the national scientific community, colleagues from other parts of the world put their names to the #FreeAriel movement. More than 200 years ago Humboldt came across a country to explore, study and report on, now Ruiz Urquiola inhabits a nation where researchers are wary of every word and prefer silence. This text was originally published on Deustche Welle’s Latin America page. This entry was posted in Generation Y, Yoani Sánchez by Yoani-Sánchez. Bookmark the permalink. I apologize for again using this space for Venezuela. There is an eerie quiet about Vzla, as if it’s so far beyond hope that there’s nothing more one can say. However, things are happening. The oil production has fallen t 1/3 of what it was 2 decades ago. In May a coup attempt was stopped. Hundreds of officers in the military were involved, but only 30 arrested. Discontent is growing, but will it ever grow strong enough to overthrow and clean out the cancer triying to pretend to be a govt?